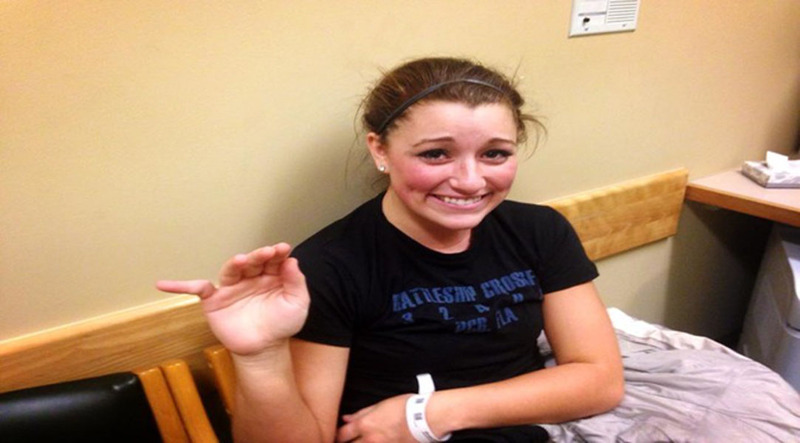 You’ll NOPE For Days When You See Just How These People Broke Their Bones.. OMG! The human body, while incredibly durable, is also very fragile under certain conditions. While bones do break, we don’t often see the actual impact that bone breakage has, unless we look at x-rays. Or unless we look at the following photos. These are all examples of what has happened when the human body was put under particular stress that was not in sync with how our bone placement was designed. Check out these incredible photos of these totally insane injuries. 1.Soccer can get physical and definitely can have some devastating bone breaking results. Ouch. 2. This hand looks like it was twisted around about a dozen times. 3.This guy either has two knees on one leg, or he’s in a whole world of extreme pain right now. 4. Bonus of a rugby accident? You get a third row of teeth! 5.This guy’s trying, but no way he’s walking to the hospital in that condition. 7. Nasty nose, or what’s left of it. 10. Another example of an ankle turning to rubber. 11. Not sure how this leg ended up completely flipped around. Nasty. 12. An arm that could get a leading role in a horror film. 13. She must be doped up on pain meds to be smiling while her pinky finger is so nasty looking. 14. This X-Ray is nasty enough. Hate to see the real thing. 15. This is kinda cool. I’d consider leaving it this way. You’ll definitely want to take some preventive measures while playing sports or doing anything physical after seeing these pics. Some nasty injuries here!